The Metal Aircraft Corp Flamingo was a small monoplane produced by the Metal Aircraft Corporation in the 1930s. 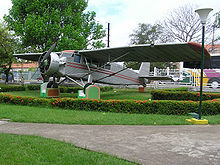 The plane is best remembered for its role in the discovery of Angel Falls by Jimmy Angel in 1935. Although well known to the local indigenous population, the falls had only been glimpsed by European explorers until Jimmy Angel crash landed while attempting to land above the falls on Auyan-tepui during gold exploration. The Metal Aircraft Corporation Flamingo that crashed above the falls was recovered in the 1960s by the Venezuelan government and is on display in Maracay.